Being one of three original HMT systems (opened in October 2000). Bearwallow Trail System is located near the ATV-friendly town of Logan, WV. It is one of the original three systems of the Hatfield-McCoy Trails and is commonly known for its single track and Most Difficult-rated trails. It’s mix of easy- riding scenic vistas and difficult trails make it one of the more popular systems for the Hatfield-McCoy Trails. This trail system has direct access to gas, food and lodging. Bearwallow is the only trail to be open to ORVs as well as ATVs, UTVs and off-road motorcycles. Has a 2+ acre parking lot, staffed trailhead, on site restrooms, permits & merchandise. Located at 40 Welcome Center Rd., Logan, WV 25601. Serves as an additional trailhead for the Bearwallow System. Has parking lot, on site restrooms, permits & merchandise available. Take the Visitor's Center connector to access the Town of Logan and Community Connector to Bearwallow. Stay in our beautiful chalet cabins, located in Logan WV, just off the Hatfield McCoy trail close to many shopping centers and restaurants. This is the perfect place to enjoy our amazing West Virginia Mountains. No trailering required; the entrance to the Hatfield-McCoy Bear Wallow Trails system is about 10 yards from the Chalet Village Cabins. Once you unload your ATVs or trail bikes, you don't have to load them back up until you are ready to go home! Our Chalets are neat and clean. They are equipped to meet nearly all your needs. The kitchen is furnished with all utensils and appliances. We supply free linens and towels, and plenty of easy access parking. Conveniently located just 2 miles from Fountain Place Shopping Plaza and 2 miles from downtown Logan, our Chalet will sweep you into the charm and excitements of the small-town life! We also sell Trail Passes to make it easier and faster for you to hit the trails. Feel free to call or email with any questions, we are here to help. The adventure awaits! Logan, West Virginia Hotel's amenities are sure to please. Travelers appreciate our West Virginia hotel's great location as we are close to nearby attractions and businesses. The Logan Holiday Inn Express® Hotel & Suites offers convenient amenities and a thoughtful, accommodating staff. Business travelers appreciate the fact that our facilities include a Business Center with copy services and computer access. Our Logan hotel also offers a meeting room for your convenience. Nearby companies include Mohawk Flooring, Massey Energy and Walmart, and we are just a few miles from downtown Logan. While in West Virginia, our hotel's guests can take advantage of our great location. Downtown offers numerous activities for visitors to enjoy and is just six miles from our Logan hotel. History buffs are sure to enjoy the Shawnee Living History Trail while families can go to attractions like Water Ways Park and Hatfield and McCoy Trails. Be sure to visit Chief Logan State Park, as well, where you can enjoy outdoor productions and the beautiful West Virginia landscape. We proudly offer free high-speed, wireless Internet access throughout the hotel for your convenience. You can relax by the indoor pool after a long day of meetings, or you can use the Fitness Center to keep up your workout routine. Be sure to also take advantage of our complimentary, hot breakfast bar each morning. Call our Logan hotel to make you reservations today! Hatfield-McCoy Country's local Kawasaki and Suzuki dealer! We're also an authorized vendor for Hatfield-McCoy Trail permits. Located right next to the Bearwallow Trail System on Rt 17. Ride your machine directly to the Bearwallow trailhead right from our location. We offer 6 cabins that can each accommodate a group of 5 guests. We have 1 larger cabin that can accommodate a group of 8 guests and has a private bath and a full kitchen. All cabins are equipped with A/C, heat, microwave, coffee pot, small refrigerator, grill and a fire pit. We also have 9 camper sites available with full hook-up. A bath house and restroom facilities are located in the middle of the property. We are an authorized retailer of the Hatfield McCoy trail permits so you pick up your permit when you arrive at the campground. Call us today to book your reservation! Chief Logan Lodge, Hotel and Conference Center is the newest lodging addition to the West Virginia State Parks system. Offering superior customer service, 75 modern rooms and suites, guest laundry, indoor pool, fitness room, and hot tub, this overnight facility is a welcome addition for travelers of US 119. The hotel and conference center are conveniently located to the Hatfield McCoy Trails and trail passes are offered at the front desk. Chief Logan Lodge has wireless internet access throughout the facility as well as cellular hot spots - a communication convenience at West Virginia’s new state park lodge. Overnight guests of Chief Logan Lodge enjoy a complimentary continental breakfast from 6:30 a.m. – 9:30 a.m. daily. The Continental breakfast is included in room rental rates. Chief Logan Lodge is a smoke free facility. Pets are permitted in designated lodge sleeping rooms. This room type is not available as an online reservation option. Please call for pet-friendly reservations. Overnight guests of Chief Logan Lodge have access to Chief Logan State Park swimming pool and water slide. Guests may reserve rooms, and modify or cancel reservations using the 'reserve online' https://us01.iqwebbook.com/CLLWV900/ button located on this page. Located at 102 George Kostas Drive in Logan. THEATRE AMENITIES • All You Can Eat Popcorn • All You Can Drink Coke/ICEE • 3D Projection • Digital Projection • Stadium Seating • Listening Devices Available Come visit us today! Discover this Chapmanville, West Virginia hotel offering comfortable and affordable accommodations near Hatfield McCoy Trails. The Best Western Logan Inn offers travelers a great location, friendly service, impeccable accommodations and unbeatable amenities all for an affordable price. This Chapmanville hotel offers convenient access to many local attractions, shopping and dining options in order to make any stay in West Virginia a comfortable one. Guests staying at this West Virginia Best Western hotel will enjoy well-appointed guest rooms featuring cable satellite television with HBO® and free high-speed Internet access. Those guests looking to indulge can request an executive suite or a guest room with a beautiful mountain view. To ensure a great start to the day, this hotel serves guests a complimentary extended continental breakfast every morning. To make life on the road in Chapmanville WV even more comfortable, the Best Western Logan Inn comes equipped with an indoor heated swimming pool and an exercise facility. Guests planning a meeting or event in Chapmanville will especially appreciate the on-site meeting space flexible enough to suit any meeting or event need. This hotel also offers ample guest parking. The Best Western Logan Inn is close to where travelers want to be while visiting the Appalachia Mountains and surrounding Chapmanville area. The official hotel of Hatfield McCoy Trail, hotel guests can conveniently enjoy a variety of exciting trails for bicycling and dirt bike or ATV riding. Guests frequently choose the Best Western Logan Inn because of its proximity to Hatfield McCoy Trail events and Coalfield Jamboree concerts. This hotel is surrounded by local mining and construction making it easy and convenient for guests to conduct business from the Best Western Logan Inn. The friendly staff at the Best Western Logan Inn in Chapmanville is ready to ensure an enjoyable stay. Make a reservation today and save! The West Virginia Division of Tourism is you one-stop-shop for all information for regarding tourism in the State of West Virginia. Pappy’s Log Cabin sits in the middle of a secluded 77 acres of West Virginia Mountain Forest. Furnished with many antiques, books and hymnals, the cabin makes a perfect setting for family singing and storytelling. Some of the cabin’s amenities include two stone fireplaces that heats the cabin with natural gas logs. All you have to do is push a button to get the fire started, the cabin heat is thermostat controlled. The cabin is outfitted with a cathedral wood ceiling in the Great Room with exposed beams. The sleeping quarters are comprised of the Master Bedroom which has a 1/2 bath, and a balcony with a full-size bed. Off the Great Room, the full bathroom is located under the balcony area and is equipped with a shower, sink, linen closet and commode. The kitchen is also under the balcony area containing an island, a 1940s model gas refrigerator, a natural gas cooking stove, sink and eat-in bar. The front porch of the cabin is outfitted with enough tables and chairs to comfortably sit the entire guest list, a gas grill with side burner, rocking chairs and a six-foot swing that’s big enough to lay down upon. Our cabin sleeps 11 people (if you all get along :-)! We have a queen size bed that sleeps 2, two sets of bunk beds that sleeps 4, full bed in a balcony that sleeps 2, a chair that makes a twin bed that sleeps 1 and a queen size hide-a-bed couch that sleeps 2. Our master bedroom has more square footage than the entire floor plans of those “mini” cabins you see elsewhere. Of course, there’s room for air mattresses, and tents outside, if you choose to bring more people (additional fee may be required for additional guests). Also check out our shooting range, fishing pond and zip line, all located on property! You’ll have the entire 77 acres ALL TO YOURSELVES! We are only a 45 minute drive to the Bearwallow Trail System. We are located right by the Ivy Branch Trail System which is set to open later this year. Welcome to Logan County, the heart of the Hatfield-McCoy Region! Our county is filled with a variety of historic, scenic, and entertaining attractions. As West Virginians, we are proud of our mountain heritage and are honored to share it with you! We invite you to come explore all we have to offer and experience your own mountain adventure! Runner Up “Best Adventure Outfitter” Best of West Virginia Awards 2018 Mountaintop Adventures is your one stop shop for your Hatfield McCoy Adventure, located onsite at Twin Hollow Campground and Cabins in Gilbert, WV! Offering Half Day to Weekly Side By Side Rentals along with Full Day to Weekly ATV Rentals, Professional Trail Guide Services, Kayak for adventures on R.D. Bailey Lake & the Guyandotte & Tug Rivers, & Guided Fly Fishing Adventures all from onsite at Twin Hollow Campground and Cabins “Southern WV’s Mountaintop ATV Resort. Also available at our office are Helmet Rentals along with Go Pro Camera Rentals to Record Your Adventures and we sell goggles, gloves, Wolfsnout Brand dust masks and other riding gear at affordable prices. Check out our website for pictures, pricing, and information on all our rentals and adventure activities and feel free to give us a call anytime with questions. Our SXS Rental Fleet Consists Of The Most Reliable Machines On The Market Today. Guaranteed to give you the adventure of a lifetime on the Hatfield McCoy Trails! Book Your Side By Side by Clicking The Book Now Button Below Or By Calling (304) 664-8864 or (304) 664-9001. [su_button url="https://www.peek.com/s/39a52f4d-68a4-43e6-a043-9c3a4a0204ff/lVB2" target="blank" background="#f58238"]Book Now: SXS Teryx & Teryx 4 Rentals[/su_button] Our ATV Rental Fleet Consists Of Suzuki King Quad 400s. Known for easy rideability, a comfortable ride, and reliability. Perfect for even a beginner rider to explore the Hatfield McCoy Trails and Guaranteed to give you the adventure of a lifetime on the Hatfield McCoy Trails! Book Your ATV Below Online Today or by Calling: (304) 664-8864 or (304) 664-9001 [su_button url="https://www.peek.com/s/39a52f4d-68a4-43e6-a043-9c3a4a0204ff/lVB2" target="blank" background="#f58238"]Book Now: Suzuki King Quad 400 Rentals[/su_button] New for 2019 Polaris Sling Shot Rentals. Explore the Devil’s Den Motorcycle Routs of Southern, WV in style on one of our new Sling Shot Rentals. Almost Heaven Deluxe Cabin Rentals in Logan County WV conveniently located One mile off US Rt. 119 Hwy. Only minutes from Chief Logan state park, Hatfield McCoy Trails, Coalfield Jamboree, Golf, Mountain Bike, Hiking, ATV, UTV, Dirt bike and Horse back Riding Trails, Helicopter rides, Wild life exhibit, Fishing, Hunting, Shopping, Dining and much more. Also a great place for a romantic getaway. Your full service dealer for Yamaha, Honda, and KTM motorcycles and ATV's. Located in Logan, W.Va. just minutes from the Bearwallow Trails. We're also an authorized vendor for Hatfield-McCoy trail permits. When it comes to fun for the entire family, GattiTown delivers! With our award winning Gatti’s pizza, pasta, salad and desserts combined with the latest in games and prizes, everyone wins! We take pizza seriously. That’s why we hand-roll dough fresh each morning, use our signature sauce with sixteen secret herbs and spices and top it all off with real smoked provolone cheese and only the best selection of toppings. Build your own or select from over 20 specialty pizzas including our famous Gatti’s Sampler! Logan’s Candlewood Suites is the perfect home away from home for all guests, whether you are traveling on leisure or for business. The full kitchens in our rooms helps every guest to enjoy the comforts of home – every room is a SUITE! While in West Virginia, our hotel’s guests can take advantage of our great location. Downtown offers numerous activities for visitors to enjoy. 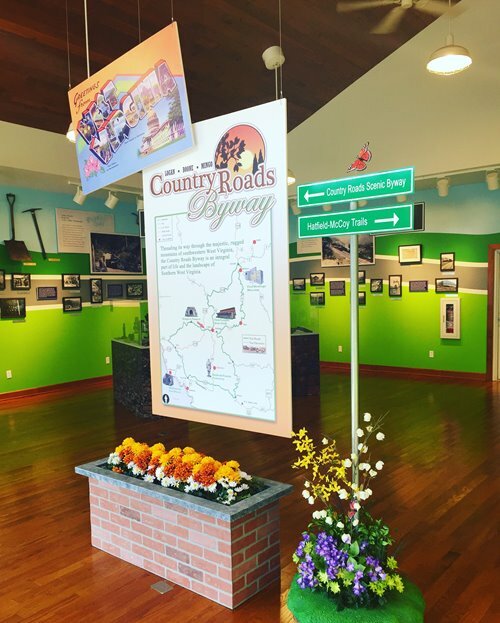 History buffs are sure to enjoy the Shawnee Living History Trail while families can go to attractions like Water Ways Park and Hatfield McCoy Trails. Candlewood Suites offers direct access to the Bear Wallow Trail Connector. You do not need to trailer your ATV when you stay with us! Purchase your Hatfield McCoy Trail Passes at the front desk in the hotel. Be sure to visit Chief Logan State Park, as well, where you can enjoy outdoor productions and the beautiful West Virginia Landscape. We proudly offer free high-speed internet, wireless internet access throughout the hotel for your convenience. You can relax at our Gazebo Grill after a long day on the trails. For your convenience, we have an on-site mud room where you can lock up your gear or clean up before entering your room. Also, be sure to take advantage of our complimentary guest laundry, 24 hour fitness and business center, and the Candlewood Cupboard where you can purchase snacks, beverages, or personal hygiene items at any time. Call our Logan Candlewood Suites or visit our website to make your reservations today!